The L-159 Advanced Light Combat Aircraft or 'ALCA' was derived from the successful L-39 Albatross family of training jets by the Czech company AERO Vodochody (Aero). The L-159 'Albatross II' was developed for the Czech Air Force's requirement for a light combat aircraft in the early 1990s. The Czech Air Force was retiring its Soviet era fighters and needed a new aircraft to fill the lower end of the fighter mix to complement the high-end fighter force of new supersonic jets, which became the JAS 39C/D Gripen. As its designation suggests, the L-159 was based on the L-59, a derivative of the L-39 jet trainer developed for export customers. The L-59 was a proven design which could be developed into an affordable light combat aircraft. The tandem canopy of the L-59 was retained, the back seat of the single-seat L-159A being occupied by an additional fuel tank. This enabled Aero to also offer a two-seat combat capable version, designated the L-159B, for training and operational conversion for potential export customers seeking a L-39 replacement. 72 single-seat L-159A were ordered for the Czech Air Force, but it was soon realised this many aircraft far exceeded the requirement, as the need for large inventories had disappeared after the Cold War. There have been no orders for the L-159B, nor have there been any customers for the surplus L-159As thus far. The Czech Air Force has ordered the conversion of a number of L-159A single-seat aircraft into L-159T1 two-seaters. There are also plans now to offer converted aircraft to foreign customers as opposed to new-built L-159Bs. Compared to the L-59 advanced jet trainer a number of changes were made in the design, although the aerodynamic configuration was retained. The airframe structure was strengthened and the cockpit area was reinforced with composite and ceramic ballistic armour to offer the pilot better protection. The aircraft's nose was enlarged to accomodate the radar, and the fuselage was extended behind the cockpit. This makes the L-159 0.52m (1ft 8in) longer than the L-59. One centre-line weapon pylon was added and the number of underwing pylons was increased from four to six. The engine was replaced with the US Honeywell/ITEC F124-GA-100 non-afterburning turbofan, providing 6,300 lb of thrust (28,58 kN). The F124-GA-100 provides about 66% more thrust than the L-39's original Soviet AI-25TL turbofan, and almost 30% more than the L-59's Slovak ZMK DV-2 turbofan. Providing a better thrust-to-weight ratio and the ability to carry full weapon loads, the new engine makes the aircraft faster and more capable in the combat role. The L-159 is much more than just an upgraded training aircraft, this becomes very clear when looking at its avionics suite. 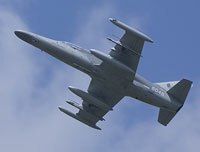 The L-159A is fitted with the Italian FIAR Grifo-L multimode pulse Doppler radar. The Grifo-L was selected in favour of the US Westinghouse AN/APG-68, in particular for its low installation requirements and maintainability. Plus the Grifo radar series has a proven record in various F-5 and Mirage fighter upgrades. The radar has five air-to-air modes including track-while-scan with four air combat submodes, and is able to track up to eight targets simultaneously. For ground and maritime attack it has nine air-to-surface modes. The single-seat L-159A and the two-seat L-159B feature the same tandem canopy. The L-159B was primarily intended as advanced and operational training, but has a secondary operational light combat capability. As mentioned earlier, the space of the back seat is occupied by a fuel tank in the single-seat L-159A, while in the L-159B it features a full cockpit including HUD repeater panel. Both versions are fitted with lightweight fully automatic VS-2C zero-zero ejection seats and a canopy jettison system. The cockpit layout was based on the standard set by the F-16. The L-159 has the digital MIL-STD-1553 integrated avionics system with two multi-function colour displays	and analogue instruments for backup. The cockpit is NVG-compatible and has NATO-compatible radios for secure communication. For navigation it uses a Honeywell GPS navigation system, with Ring Laser Gyro INS as backup. The Head-Up Display is the FV-3000 by Flight Vision, the same as is fitted to Pilatus PC-7 and PC-9 trainers. Like the F-16 and other modern combat aircraft, the L-159 provides the pilot with Hands On Throttle And Stick (HOTAS) functionality. The L-159 is capable of carrying a wide range of NATO-compatible weapons. The short-range air-to-air AIM-9M Sidewinder missile has been integrated, future integration of air-to-air missiles will include the IRIS-T and ASRAAM and possibly the medium-range active radar guided AIM-120 AMRAAM. For the air-to-ground mission the AGM-65 Maverick air-to-surface missile has been integrated, laser guided bombs are also planned to be added to the L-159 arsenal. Unguided weapons include Mk.82 bombs, CBU-87 cluster bombs and LAU-5002 rocket launchers. Integration of more air-to-ground weapons is subject to the requirements of any prospective customers. The aircraft is also capable of carrying a podded 20mm cannon. Additionally, the Thales Vicon 18 series 601 reconnaissance pod has been evaluated on the L-159 to further expand the multi-role possibilities of the aircraft. The electronic warfare system consists of the GEC Marconi (BAE Systems) Sky Guardian 200 radar warning receiver and the Vinten Vicon 78 series 455 chaff/flares countermeasures dispensing system. As mentioned in the introduction, the Czech Air Force ordered 72 L-159A single-seaters. The first L-159A arrived at Çáslav AB on December 27, 2000, joining the 42 Fighter Squadron, which later became 212 Fighter Squadron. The squadron initially received 36 aircraft. L-159s also joined the Su-22s at Namesti nad Oslavou until their retirement. Subsequent economic conditions resulted in defence cutbacks, putting the L-159As into storage. 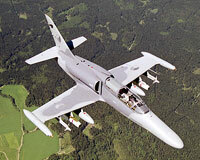 212 FS remained as the sole L-159 unit with just 18 L-159A ALCA and six aircraft as reserve. Over the following years, the Czech L-159A has proven itself in the strike role and its self-defense capability. It has been reported to have claimed even some F-16 and F-18 'kills' during NATO exercises. The L-159A has also proven that is has retained the excellent reliability of the L-39 family, having been praised the most reliable aircraft in the NATO Air Meet in Turkey. On July 26, 2006, the Czech MoD signed a contract with Aero Vodochody to convert four existing L-159A to the two-seat L-159T1 to fulfill the Czech Air Force's requirement for a two-seat version to use as conversion trainer to the single-seat L-159A. L-159T1 is the designation introduced by the Czech Air Force, Aero Vodochody also referred to the conversion as L-159BAT ("B from A for Training"). The L-159T1 conversion replaces the front fuselage with a new one providing the second cockpit. The new version lacks cockpit protective armour, but closely resembles the L-159A on all other areas to provide a good conversion trainer. Aero Vodochody has been marketing the L-159A/B ALCA to a number of international customers, but so far failed to attract any customers. It even teamed up with Boeing in the late 1990s. 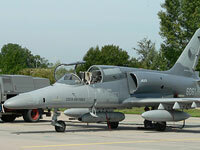 The Czech MoD also failed to find any takers for its surplus of 47 L-159A ALCAs. Despite this, Aero Vodochody continues to develop the L-159 offering new capabilities to potential export customers, including aerial refueling capability. Venezuela was the first prospected customer, having test-flown the aircraft in February 1998. Although Venezuela ordered the AMX-T instead, that deal never materialized either. Currently banned by the USA from acquiring aircraft with US components, Venezuela is not able to procure the AMX-T not the ALCA. Venezuela was followed by South Africa in June 1998, also seeking an advanced jet trainer. However the competing BAE/Saab team secured a combined order for the Gripen and Hawk trainer. A handful of other countries followed, including Greece who considered the two-seat L-159B to replace its T-2 Buckeyes. Ultimately Greece selected the turbo-prop T-6 Texan II. With the surplus ex-CzAF L-159s and possible conversion to two-seat trainers being available now, more potential customers have been emerging; Nigeria, Georgia, Indonesia, and Latin American countries, including Bolivia and Colombia. 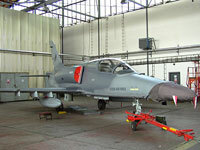 The Czech MoD is trying hard to find customers, as maintaining the 47 surplus L-159s in airworthy condition is costly. If the MoD does not find a customer soon, the maintenance costs will have exceeded their selling price. In October 2006, the L-159B was once again offered to Greece, this time in the form of L-159BAT, a two-seat trainer converted from CzAF L-159A surplus, now designated L-159T1 by the CzAF. The offer did not materialize in a deal. In November 2006, during a meeting between the Czech Defence Ministry and Indonesian Defence Ministry, Indonesia expressed its interest in the L-159 to complement its training fleet. The parties signed a military co-operation agreement which included support for further talks on a proposed L-159 sale. According to Aero officials the deal could be for up to 24 aircraft. Nigeria has been negotiating the possible sale of a number of surplus L-159s for its air force since December 2006 to replace the Nigerian Air Force (NAF) Alpha Jets. Only a handful of the 24 delivered Alpha Jets are thought to remain in service, with at least ten aircraft known to have been written off in accidents and the remainder suffering from a shortage of parts. In March 2007 the L-159 deal appeared to be nearing completition, however no contract is known to have been signed. The plan included the refurbishment of the air force's existing fleet of 24 L-39ZA aircraft, which it received in 1986-87. The NAF ordered a second batch in 1990, none are thought to have been delivered, although 22 were completed before the contract was cancelled due to an arms embargo. Only a handful L-39s, estimated to be around ten examples, remain in service. Georgia has also emerged as a potential customer after the L-159 had been offered during a visit of the Czech Minister of Defence to Tbilisi in May 2007. Georgia is thought to have a requirement for 10-12 aircraft. Georgian officials planned to visit the Czech Republic to inspect the aircraft in the summer of 2007. Bolivia's Minister of Defence had inspected the L-159 on his visit to the Aero Vodochody factory, during his stay in the Czech Republic in June 2007. Bolivia was reported to be interested in acquiring six to ten surplus L-159As with possible conversion to L-159T1 trainers. EADS CASA was involved in the negotiations, offering the Czech Republic two C-295 transports for the CzAF to be paid for by Bolivia which would then receive two of the L-159s in exchange. Local media reports in the Czech Republic on March 26, 2008, reported that the proposed deal had been abandoned. Despite six months of negotiations the involved parties could not come to an agreement that was financially viable for the FAB. With the availability of second-hand L-159A, converted L-159T1, the proposition of affordable new-build L-159B trainers offered together with ground training system, full mission simulator, logistics support, ground support system, an L-159 package should be an interesting option for any air force in need in either an advanced jet trainer, light combat aircraft, or both! However, it faces some strong competition. Aero Vodochody, (2007). AERO Vodochody a.s. official website - http://www.aero.cz, 2006-2007, Czech Republic, last accessed on 17 Dec 2007. AFM, (2007). 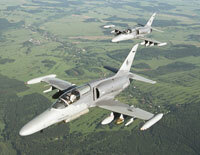 Indonesia Offered Czech L-159s, Air Forces Monthly #227, February 2007, p.20, Key Publishing Ltd, UK. AFM, (2007). Surplus Czech L-159s Offered to Nigeria, Air Forces Monthly #227, February 2007, p.21, Key Publishing Ltd, UK. AFM, (2008). Bolivian L-159 Deal Abandoned, Air Forces Monthly #242, May 2008, p.17, Key Publishing Ltd, UK. Airforce-Technology.com, (2007). L159 ALCA Advanced Light Combat Aircraft, SPG Media PLC, UK. Last accessed on 17 Dec 2007. Keijsper, G., (2007). Against All Odds, Air Forces Monthly #230, May 2007, pp.44-49, Key Publishing Inc., UK. Silent, J., (2007). Possible Czech L-159 Sales to Georgia and Nigeria, Air Forces Monthly #232, July 2007, p. 14, Key Publishing Inc., UK.